Print ISSN: 1044-0054, eISSN: 1540-7365. Triggered: May 2011. Originally published by Informa Healthcare between 1990-2008, the Journal of Pharmacy Teaching produced 14 volumes highlighting new methods in pharmacy teaching for the professional pharmacology community. Under Taylor and Francis, the journal ceased publication in 2008. 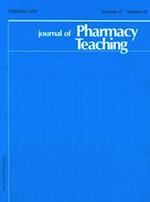 In May 2011, CLOCKSS triggered the Journal of Pharmacy Teaching to the public. It is now available for free to everyone. After receiving Journal of Pharmacy Teaching content in the form of XML, PDF, and other digital formats from Taylor and Francis, CLOCKSS created a representation of each volume in HTML by transforming the XML data and adding the PDFs that comprised the volume. Volumes 1-14 are now available from CLOCKSS host institutions, EDINA at University of Edinburgh, and Stanford University. The Journal of Pharmacy Teaching content is copyright Taylor and Francis and licensed under a Creative Commons Attribution-Noncommercial-No Derivative Works 3.0 United States License.